The Listening Cloud is a data-driven light sculpture that visualizes social media conversation in real-time. Whenever tweets, hashtags, likes or comments occur about whatever the cloud is programmed to monitor, it storms with multi-colored lightning that corresponds to the different social media channels. A web interface allows viewers to choose what the cloud is "listening to", displays a raw feed of the data it's processing, and features a key to understand what the lights signify. The idea behind it is to show what's happening in the social media 'cloud' in real-time, not as data or a visualization on a screen, but as a fun, simple, sensory, physical thing. 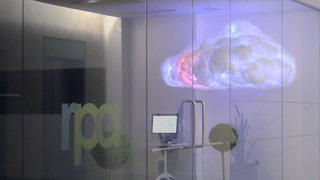 As an installation in the RPA lobby, it creates a continuous display and awareness of the buzz around client brands. The current cloud is a prototype and there are plans to explore its possibilities and evolve further iterations. A DIY how-to video was also created and a zip file of materials and code was made available for download here in order to see what others might come up with.